View a eulogy for James Samson McHone, USMA '70, who passed away on April 1, 2015. Jim McHone was a great friend and wonderful soldier, doctor, and USMA 1970 Classmate. Although we did not know each other as cadets, we became friends while he served on the Hospital Staff at USMA and I was on the Staff and Faculty. A great Army Sports Fan, Jim dedicated countless hours working with Army Teams and making them "heal". In addition, he chaired many of our class reunions and ensured that our classmates thoroughly enjoyed every minute of them. 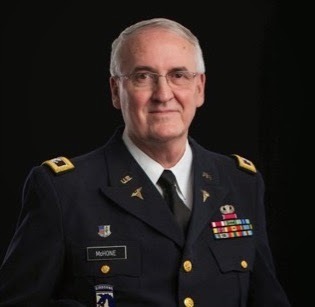 He absolutely loved his family and West Point, and was a renowned expert in his medical field. Not a day goes by without me missing Classmate Jim McHone. Well done! Thanks!